Haagen-Dazs is getting set to launch a new line of ice cream, that they're calling the "Trio Collection," featuring layers of ice cream and crispy Belgian chocolate. - Coffee Vanilla Chocolate - Layers of crispy Belgian chocolate, coffee ice cream, and vanilla ice cream. - Triple Chocolate - Layers of crispy Belgian chocolate, white chocolate ice cream, and milk chocolate ice cream. - Salted Caramel Chocolate - Layers of crispy Belgian chocolate, salted caramel ice cream, and chocolate ice cream. - Vanilla Blackberry Chocolate - Layers of crispy Belgian chocolate, vanilla ice cream, and blackbery ice cream. According one Haagen-Dazs social media posting, the flavors are "coming soon." 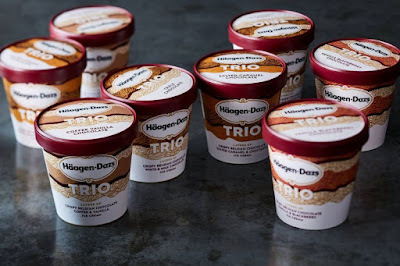 The new line might be considered Haagen-Dazs' answer to Ben and Jerry's Core ice cream line, which features dual ice cream flavors and a sweet core. But while the Core line is oriented vertically, the Trio Collection is more horizontal. Update 2/7/2017 - The four flavors are confirmed for the launch. They're currently being rolled out and should be widely available by April 2017. The suggested price per 14-oz carton is $5.49.